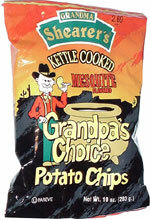 Taste test: These are really good barbecue chips. They're very crunchy kettle-style chips with a sweet and very flavorful barbecue taste. The mesquite is barely noticeable, or at least very subtle. "Time went by, as it does all too fast when you're my age, and after 3 years of potato chip recipes and me tellin' her, 'Nope, not yet,' she was at it again when my grandson Tommy came visitin'. He presented Grandma with a wooden spoon (about the size of a fryin' pan) that he had whittled out of Texas Mesquite wood while on a Boy Scout outing. "Little Tommy took it hook, line and sinker when I told him how much Grandma neede a magic spoon to help her with her cookin'. But old Grandma is short on temper and long on words, and when she finally got through yellin' at me, she remembered her potato chips ... and Tommy!